Sol Republic revealed the Bluetooth wireless Amps Air earbuds. They are supposed to last up to three hours on a charge and cost $179.99. Sol Republic has recently announced a new wireless earbud that could offer owners of the headphone jack-less iPhone 7 some quality sound. The Bluetooth-based Amps Air is supposed to offer that kind of high-end audio in a very small package. 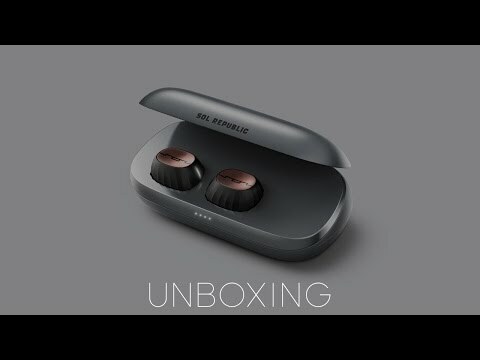 In a blog post, Sol Republic stated the Amps Air have an “advanced antenna design” so that owners can get the best Bluetooth wireless connection possible, along with “big deep bass and amazing clarity” for audio. The Amps Air can last up to three hours on a single charge, and also come with a charging case that will recharge the earbuds over 15 times in a single charge. The case also can double as a smartphone external charger with its USB port and its own 2200mAh battery. What’s more, the earbuds can automatically turn on when they’re removed the case, and they’ll turn off and start recharging automatically when they are placed back in the case. The Amps Air earbuds themselves are wrapped in a silicone sleeve which have tapered grooves, which is supposed to help keep them in place inside your ear, even if you are wearing them during a hard workout. The Sol Republic Amps Air come in Rose Gold, Black, Teal, and Blue colors and are priced at $179.99. While a launch date for the earbuds has yet to be announced, they will be available at Best Buy, Amazon and solrepublic.com.